What is G.I. Effects Testing? Everyone knows a blood test can give insights into what is happening in a person’s body. But did you know there is another test that looks at something just as important? 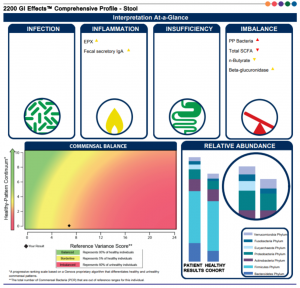 The GI Effects Comprehensive Stool Profile can give your doctor detailed insights into the health of your gut microbiome. The article, Why the Gut Microbiome is Crucial for Your Health, explains that gut microbiome is all the microbes in your intestines. This plays a vital role in your health since the gut microbiome controls the digestion of food, the immune system, central nervous system and other functions of the human body. Research has shown that your gut microbiome can influence everything from digestive issues such as irritable bowel syndrome (IBS), Inflammatory Bowel Disease (IBD), Celiac and other malabsorption disorders, diabetes, autoimmune disorders, weight gain and other conditions. Studies have also found that certain bacteria within the gut microbiome can produce chemicals that may block arteries and lead to heart disease. Testing your gut microbiome is done with the GI Effects stool test. It’s important that you tell your doctor any over-the-counter or prescription medications you are taking, since some could interfere with test results and will need to be stopped prior to the test. You will collect your sample in the comfort of your home and then mail it to the lab. The lab will then do tests on your stool sample to determine your digestive function, gut inflammation and your gut microbiome. A report is sent to the doctor which identifies any found infections, inflammation, insufficiency and imbalances. This information is then used to determine a personalized treatment plan. Since this report identifies functional imbalances and inadequacies, your doctor can recommend specific dietary, lifestyle and necessary supplements that can help your specific situation. Many patients have become frustrated with reoccurring symptoms and medications that do not address the problem. The GI Effects test helps get to the root of the problem, which often leads to lasting results. If you’re interested in scheduling an appointment at Turack Chiropractic and Performance Health, please contact us at 724.940.3499 or info@turackchiro.com. Tagged functional medicine, GI Effects Comprehensive Stool Profile, GI Effects Testing, Gut Health, Stool TestLeave a Comment on What is G.I. Effects Testing?